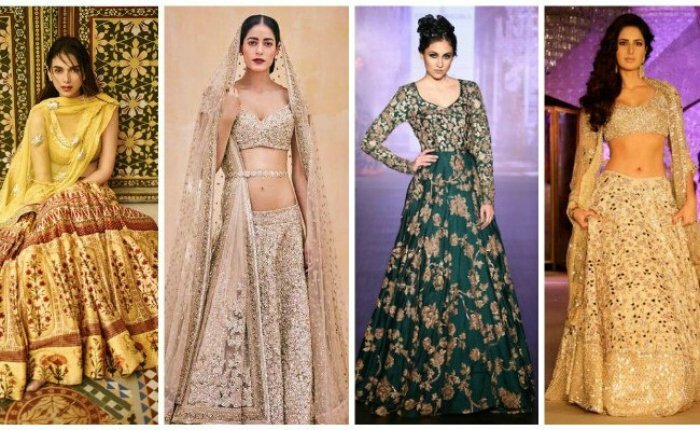 Get inspired by the latest designer bridal lehengas perfect for this year’s summer season! We all love being bang-on with the latest trends. More so if it is for a milestone event like a wedding. This season, designers have displayed a fondness for subdued colors in light tones for bridal wear. Lehengas in pastel hues are all the rage right now. And why not! Soft shades are just right for sultry summer weddings or romantic daytime functions. What’s more, they also help enhance the bridal glow and let you go all out with the makeup and jewellery without making the bride look over the top. Buoyancy, lightness, finesse and froth match the mood of today’s new generation Indians who prefer comfort and fit over heavy, cumbersome old school bridal and occasion wear. Designers such as Anita Dongre used a cream and pastel shades that were offset by a lot of computer embroidery and dazzling gota patti work. Pastel shades also make the jewellery stand out. A seafoam lehenga worn by Archana Vijaya and designed by Tarun Tahiliani created a lot of waves for the unusual shade of pastel that made the bride look totally ethereal. Ombre is a trend that has continued even in pastel lehengas. so whether it is a graded dye of the same color family or a pairing of two contrasting colors on the same outfit, it still looks stunning. In the same vein, double color lehengas are nothing new. This season, try just the border in a contrasting, unconventional color like purple, orange or mint green with your pastel lehenga. Designer Manish Malhotra packed a modern punch with his bridal collection that paired pastel colors with dark contrasting hues – beige with midnight blue, light blue with deep orange and so on. Anarkali lehengas – in which the choli is sewn with long Anarkalis that go down to the length of the lehenga also look good with pastel shades. A sheer Anarkali top over the choli that ends a couple of inches above the floor is a great choice for a silhouette for a pastel lehenga. Gota borders have been in trend since 2014, and this year, designers like Reynu Taandon and Ritu Kumar have showcased embroidered gold borders. Both wide and narrow borders are trendy. Also try heavy tassles at the corners of dupatta. In terms of surface work, the latest styles of soft-hued wedding lehengas have crystal, dabka, dori, gota, zardozi, mirror work, patchwork and brocade. The trendiest colors for summer 2016 are blush fuchsia, soft peach, beige, rose pink and champagne. Designer Sabyasachi added a lot of shimmer to his pastel lehengas to give them a heavy and ornate look.